Provide comfort for the family of Zella Erickson with a meaningful gesture of sympathy. Zella P. Erickson, aka Granny, passed away February 4, 2019 right after family had said goodnight and gone home. Born June 28, 1931 in Buffalo, NY to John and Zella Petersen, Zella moved as a young girl with her parents to Glendale, CA. and graduated from UC Berkley, subsequently taking seasonal jobs at both Death Valley and Yellowstone Park. She met Gordon Erickson while he was visiting Death Valley. They married in 1955, and made their home at the E Bar L Ranch in Greenough, MT. Zella played an instrumental role in the guest ranch business, procuring friendships from around the world and then remembering everyone no matter how many years between visits. Zella mastered the art of leading guests on horseback rides and took many groups to tour Glacier and Yellowstone parks. She loved sharing points of interest around the state and was a sure source in identifying Montana wildflowers. She passed the ranch office business to her daughter-in-law Connie, and now Connie is keeping Zella’s legacy alive. Andy and John came into Zella’s life in 1956 and 1958. Zella raised her sons as a single parent after Gordon’s untimely death in 1962. 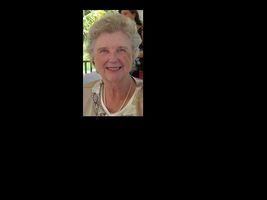 She taught the boys the ranch life and imparted to them the love of the outdoors and alpine skiing. Zella had friends all over the valley and spent countless hours volunteering, going to church, attending parties, and hosted an annual Christmas party for decades. Numerous dogs and cats had the privilege of being Zella’s beloved companions, and hopefully they are reunited with her now. Zella is preceded in death by her parents John and Zella Petersen, and her husband Gordon Erickson. She is survived by her son Andy and his wife Connie and their children Annika and Lars of Greenough, MT; son John and his wife Ginny of Denver CO; and brother Jack Petersen of Los Angeles CA. Zella chose to be cremated. Her ashes will be put in the columbarium next to longtime friend Betty DuPont at the Holy Spirit Episcopal Parish. In lieu of flowers, donations can be made to Mountain Lakes Presbyterian where she attended church in Seeley Lake, Paws Up Safe Home in Potomac where her dog Angel was adopted, or the Blackfoot Challenge. Our sincere thanks to those who cared for her: Connie Erickson, Mary Adams, Barb Dickinson, Beth Layman, Heidi McDonald, Nancy Welbaum, BeeHive Homes and staff, and Hospice of Missoula. A memorial service will be held at the E Bar L Ranch in May, date and time TBA. To send flowers in memory of Zella P. Erickson, please visit our Heartfelt Sympathies Store. We encourage you to share your most beloved memories of Zella here, so that the family and other loved ones can always see it. You can upload cherished photographs, or share your favorite stories, and can even comment on those shared by others.